I’ve kept quite busy with a lot of odd projects this summer–gardening, web design, reorganizing my kitchen, to name a few–but that doesn’t stop me from knitting on an almost daily basis. My local gym (an Anytime Fitness branch) passed out canvases to some of us artistic types with the logo traced on. We were told we could do anything we like with the canvas. I haven’t painted in years with actual paint, but I have discovered I can paint with yarn! …a skier dressed in an absurdly colorful wardrobe! His sweater is the same color as my sweater. His hat was made from leftover yarn I used to make a hat for my dad’s girlfriend. The fiery scarf came from scraps after making myself a pair of fiery socks. I have no idea where the yarn for the mittens came from, but it sure is a gorgeous color and looks like something I’d buy! I did have to buy flesh-colored yarn for the head–that’s not a usual working color for me. I made sure to use different stitches and techniques for each piece. The boots and scarf are in garter stitch. The legs and head are in stockinette. There’s a fun cable on the sweater and I used the same concept of “turning the heel” on socks to “turn the elbow” on the arms. 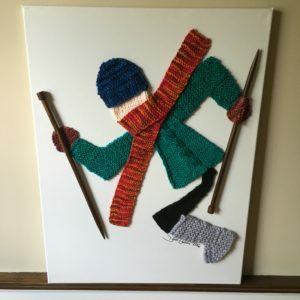 After all of this came together, it was only natural to use knitting needles as ski poles. Thank you Tuesday Morning–$5 for a very sizable and quality pair of wooden straight knitting needles. The tricky part was attaching it all to the canvas, but a glue gun and steady hands did the trick. I have to say this is one of the rare times (I’ll touch on another time in a future post) that I’ve come up with an original concept and was able to make the finished product match up with the vision in my brain. I am so proud of how this turned out and very excited my work of art will be on display for others to enjoy. I hope they hang it near the treadmill so I can dream of other knitting projects while I am exercising. And to anyone reading this–dare to dream with your yarn and knitting. You just might surprise yourself! Recently I posted a picture of my grandmother on social media because she is one of my biggest inspirations in regard to crafting (and living a long full life!). She certainly is deserving of her own post here. So without further delay, please let me introduce you to Norma Durkee. Mother of 7, grandmother of 8, adopted mother of several, admired and loved by many beyond blood lines. She’s lived through so much history and still loves her sweets! 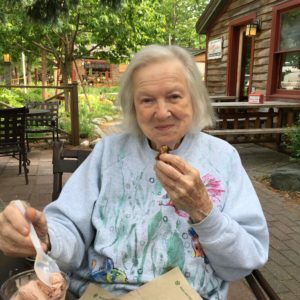 She is pictured here enjoying a bite of a cookie and a scoop of ice cream from Cherry Republic, a local treasure in Glen Arbor, Michigan. She has crafting in her blood and I’m so glad I’ve been able to tap into that heritage within myself. She sews so many neat things (even to this day at 92 years of age) and she has knitting projects near every recliner at her house and the family cottage. It’s no wonder I never leave home without knitting–it is truly in my DNA! I have several memories of crafting with her while I was young. She helped me learn some knitting basics (in combination with a VHS tape and book my mom had around the house). We recently made a new memory by spending a night together at our family cottage during a strong thunderstorm. She kept knitting calmly in her chair while I worked on a prototype seat cover she commissioned me to make for our dining chairs at the cottage. It was a peaceful night of crafting and communing with mother nature. At 37 years old, I am so incredibly grateful to have both of my grandmothers alive and doing relatively well and even more blessed to enjoy evenings like this with Grandma Durkee. I hope to make even more crafty memories with her! …but not just in health and nutrition! 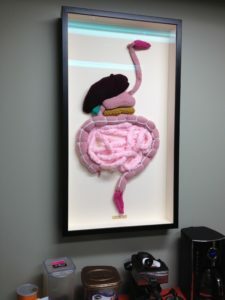 Fiber (in the form of yarn) can be used to craft a neat digestive system as well. One of the first projects I learned to knit was this digestive system, thanks to a pattern I found on the Wayback Machine by Matie Trewe. Whenever someone asks about something fun, unique, or interesting I’ve made, this is my go-to project. I used to work for a probiotic company several years ago. 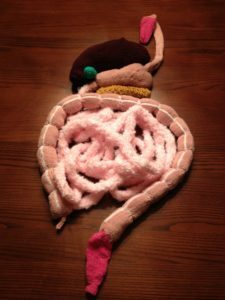 One day I found myself searching for images of the digestive system for a presentation, when I stumbled upon a picture of a knitted version. My brain filed that away–it was hard to forget seeing something so interesting! A few years later I thought it would be a fun idea to knit this for my husband, who happens to be a gastroenterologist specializing in hepatology. After I had a few scarves and hats under my belt, I figured this couldn’t be too hard, right?! In actuality, it was far from the most complicated pattern I’ve ever attempted and it was the perfect time in my knitting journey to give this project a whirl. Full of a wide variety of increases, decreases, short rows, and other techniques, it was a perfect way to learn skills necessary to the art of knitting while not having to worry if the finished product would fit or look just right. I bought fairly inexpensive yarn for most of the project, with the exception of yarn used for the liver. I made that yarn had a little bit of cashmere since it is the most important organ, according to my husband (after understanding what the liver actually does I have to agree with him). There was much ripping back and restarting, some head scratching trying to decipher what the author meant, and many hours spent on our third floor watching weird television shows while knitting several feet of intestine. This project represents a good 60-70 hours worth of work. The moral of the story: opportunities to learn the craft of knitting can come from the most interesting of places. And opportunities to combine a love of science with the fiber arts are abundant; check out a few of my favorites below. 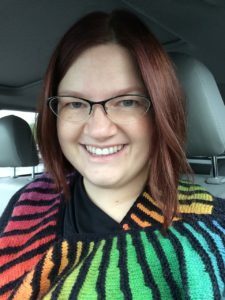 There are nerdy knitter groups on Ravelry.com as well if you’re looking to connect with like-minded individuals. Have you knitted or crocheted any fun science-themed projects? Please share in the comments! Hello. My name is Devon Gholam and I am the owner and “wise owl” at Wise Owl Designs. I am a practitioner of many crafts, especially knitting and sewing. 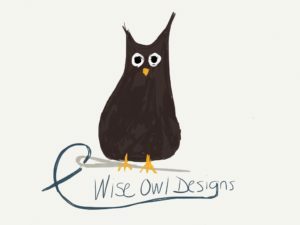 Please allow me to tell you the story behind Wise Owl Designs. Although I learned knitting basics as a young girl, my love of the craft came to fruition around 2010. I met infrequently with a few friends to knit and catch up on our lives. The spark turned into a flame and I became very serious about the craft, turning out hats, scarves, baby sweaters for my best friend’s children (as practice for sweaters for myself), among other things–I even knit a digestive system but I’ll save that story for another post. Around this same time in my life, I worked in a technical sales/support position that required a great deal of travel. Knitting kept me busy while in transit as well as keeping me calm through a variety of travel hiccups. While my schedule didn’t allow for many tourist activities, I often was able to find a few minutes to check out local yarn shops around the country. My yarn stash grew, as did my love for yarn, color, and working with my hands. In 2014, my journey through life hit a few stumbling blocks. I lost someone very close to me and became caregiver to a dear relative. My husband and I decided it was best for our family if I left my job and stayed home to take care of our relative. Needless to say it was quite the shock to move from constantly on the road to staying at home. My knitting continued to provide much needed solace. And my additional free time gave me a chance to pursue another avenue–sewing. I purchased an inexpensive sewing machine from IKEA and got started with a few simple projects. One of the first items I sewed was a knitting project bag for my mother. Being the great mother she is, she encouraged my sewing just as she has every other activity I’ve tried in my life. But this time it was different–she showed off her bag to friends at work and I quickly found myself receiving orders and requests for bags. I had toyed with the idea of opening an Etsy shop and have since found it was the most convenient way to take care of money transfers, as well as getting myself out there and providing an avenue for people to see my work. Of course I needed a brand and a logo–if I learned anything during my time in the corporate world, branding is everything! I settled on Wise Owl Designs because of my grandmother’s love of wildlife and nature. Shortly after I registered this domain, sketched out a rough logo, and set to work. My wildly talented cousin was kind enough to bring my sketch to electronic life. Voila! Wise Owl Designs opened for business on Etsy in February 2015. Soon after my grandmother started getting in on the action and asked me to make items for her. One of my husband’s coworkers gave me several custom orders that allowed me to experiment with different ideas and fabrics. Over time, people I had no connection with started ordering from my Etsy store. To this day, I still get excited with each order that comes through, whether a relative, friend, repeat customer, or someone completely new. I’ve had customers in nearby towns in Ohio and as far away as Norway and Australia. I take a great deal of pride in everything I make and am humbled that the feedback I have received reflects my dedication to making quality products. Now that my fabric stash has become nearly as large as my yarn stash, I am continuing to make new project bags, tote bags, hats, and pouches. I also am working on organizers for knitting needles and crochet hooks. I even have a few ideas for knitting patterns, which is my pipe dream for Wise Owl. I am grateful to the support of my mother and grandmother, as well as my other grandmother who is a talented knitter and seamstress herself. She loves to quality check the items I make when I visit her and I enjoy getting her stamp of approval. I also am very grateful to my husband, who has allowed me to pursue Wise Owl long after my caregiver duties have concluded. My dear friends in my regular knitting group have my undying gratitude for dealing with my questions, field testing items for me, and putting up with occasional swearing when my knitting projects have become frustrating. There is so much love and support that has gone into Wise Owl Designs that a little bit spills over into every item I make. Thank you for visiting Wise Owl Designs. Please take a moment to look my Etsy shop and come back often for updates and news. Best of luck wherever your life takes you–don’t forget to bring your knitting!